The realization of the Supramental Consciousness would virtually establish a perfected life on earth which has hitherto been considered to be the ultimate Utopia that can be only achieved in an unearthly paradise. Up to now, the highest perceived consciousness has been somewhat achieved in few individuals in the realm of the soul but not ‘in substance’ (The Life Divine, pg 174). Sri Aurobindo opts for a realization not only in soul but in the very substance, albeit in the grossness of life. Yet whatever has manifested on earth has not blossomed from a tabula rasa but has evolved from the Inconscience. Sri Aurobindo explains that whatever evolves has been already involved as principles and potentialities by a phenomenon of descent of such principles from the creative Supramental Consciousness. If that is so, then the principle of Supermind itself must be involved as a seed in the Inconscience waiting for the opportune moment to manifest. Though the Supermind has not yet created the heavenly paradise on earth, it is ‘still held in the subconscious memory of the earth-nature’ (Ibid)waiting to be manifest ‘even if never more or less realised in past aeons as a first type for future cycles’(Ibid). Though it has not yet established its reign on earth, the ideal of the Supermind has been present as a possibility and potentiality. ‘The Ideal is an eternal Reality which we have not yet realised in the conditions of our own being, not a non-existent which the Eternal and Divine has not yet grasped and only we imperfect beings have glimpsed and mean to create’ (Ibid, pg 175). 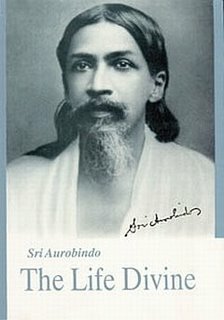 In fact, Sri Aurobindo’s yogic endeavour was meant to create the optimal conditions for the integralist Supermind principle to manifest in the flux of chaotic division that characterizes the ordinary mind, the turbulence that characterizes life and the rigid limitations that characterize the body. If mind , life and body are capable of being elevated to their highest idealist poise, if they can be transformed in terms of the Supramental Consciousness , then somewhere there must be a link between the Supramental consciousness and the ordinary consciousness, a link that has been separated and cut off to produce a world of ignorance; ignorant as it is not aware of its highest potentialities. Sri Aurobindo explains that the Supramental Consciousness is not only the culmination of the growth towards perfection of mind, life and body but the source and creative origin of these attributes. ‘What Mind, Life and Body are in their supreme sources and what therefore they must be in the integral completeness of the divine manifestation when informed by the Truth and not cut off from it by the separation and the ignorance in which presently we live, -- this then is the problem that we have next to consider. For there they must have already their perfection towards which we here are growing…..The type of all perfection towards which we grow, the terms of our highest evolution must already be held in the divine Real-Idea; they must be there formed and conscious for us to grow towards and into them: for that pre-existence in the divine knowledge is what our human mentality names and seeks as the Ideal’ (Ibid, pg 175). The human mind has already developed to matchless proportions in its journey from the rudimentary beginnings when it invented the wheel and discovered the usage of fire to the highly sophisticated intellect today that send spaceships and replaces human functioning by robots. One could argue that a further extension of the mind’s capacities, either in substance or in ethereal space would lead us to the perfected functioning of the Mind in the highest Supramental Consciousness. Sri Aurobindo explains that in spite of the intellect’s brilliance, the mind as we know in the world today would not be capable of manifesting the potentialities that can only be sported by the Mind in the Supramental Consciousness. This is not a defect of the ordinary mind but its limitation that was intentionally designed by the creative Supramental Consciousness because it was intended to be ‘in its essence a consciousness which measures, limits, cuts out forms of things from the indivisible whole and contains them as if each were a separate integer’ (Ibid, pg 176). This was necessary to build a universe of variability and multiplicity. It is true that the variability and multiplicity which are the hallmarks of creation cannot be grasped unless the integers that make up the whole are studied in details. Gestalt psychology acknowledges that the whole which is greater than the parts acquires attributes that cannot be interpreted by analysis of the independent parts. The votaries of Wholism adds another dimension by considering that the parts which make up the whole are all interconnected and thus cannot be understood without understanding the entire whole. Sri Aurobindo’s Thought accepts both the principles of Gestaltism and Wholism and transcends them both by explaining that the Ultimate Whole cannot be understood at the level of the mind but at the Supermind. The mind deals with ‘wholes that form part of a greater whole, and these subordinate wholes again are broken up into parts which are also treated as wholes for the particular purposes they serve. Mind may divide, multiply, add, subtract, but it cannot get beyond the limits of this mathematics. If it goes beyond and tries to conceive a real whole, it loses itself in a foreign element; it falls from its own firm ground into the ocean of the intangible, into the abysms of the infinite where it can neither perceive, conceive, sense nor deal with its subject for creation and enjoyment. For if Mind appears sometimes to conceive, to perceive, to sense or to enjoy with possession the infinite, it is only in seeming and always in a figure of the infinite. What it does thus vaguely possess is simply a formless Vast and not the real spaceless infinite. The moment it tries to deal with that, to possess it, at once the inalienable tendency to delimitation comes in and the Mind finds itself again handling images, forms and words. Mind cannot possess the infinite, it can only suffer it or be possessed by it; it can only lie blissfully helpless under the luminous shadow of the Real cast down on it from planes of existence beyond its reach. The possession of the infinite cannot come except by an ascent to those supramental planes, nor the knowledge of it except by an inert submission of Mind to the descending messages of the Truth-Conscious Reality’(Ibid, pg 176).